Date: Fri 26 Oct 2018. Meet: Entrance, John Rylands Library, 2.30pm. Booking: Not yet, but please just turn up anyway! This is an ingenious new tour dedicated to a man who probably never came to Manchester. But why should that matter? The city centre is alive with mementos to the Bard and dedications to his protagonists. We’ve found seven obvious locations (just like the seven ages of man), in Manchester city centre. * A portrait by Ford Madox Brown in the Art Gallery. * The Shakespeare window (and relief of a sword) in Central Library. * A tribute outside the Opera House. * A statue outside the Theatre Royal. * A cartouche on the side of the Midland Hotel. 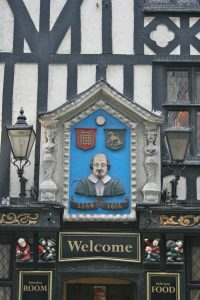 * The Shakespeare pub on Fountain Street. * Statue at the John Rylands Library. Alongside the Shakespeare statue at the John Rylands Library is one of Francis Bacon, the subject of the greatest conspiracy theory in British literary history for many believe it was he, not Shakespeare, who wrote the Shakespeare plays. In the civic quarter there are the shields, reliefs and statues inside and outside the Library, Town Hall and Free Trade Hall paying tribute to mediaeval kings featured by Shakespeare in his plays. For instance on the Princess Street wall of the Town Hall is a statue of Edward III, the 14th century king who brought the Flemish cloth workers to Manchester. Experts believe the play The Raigne of King Edward the Third (1596) was partly written by Shakespeare (the other author was Thomas Kyd). It is somewhat insulting towards the Scots, which might explain why it was not included in the First Folio which was published just after the Scottish king, James VI, had become James I of England and Scotland. Everywhere across the city we shall catch the ubiquitous bee – “Creatures that by a rule in nature teach/The act of order to a peopled kingdom” as Shakespeare put it in Henry V. We shall end the tour at Central Library where the good folk from the Archives section will show us a genuine Shakespeare First Folio! And we haven’t forgotten about you, the audience. After all, what is the city but its people?